Insulin Resistance: What Is the Main Cause of Insulin Resistance? What Is the Main Cause of Insulin Resistance? How Do You Develop Insulin Resistance? If you’ve heard your provider say that you are “insulin resistant,” you are not alone! 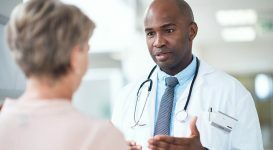 According to Pharmacy Times, it is estimated that 60 to 70 million people in the United States are affected by insulin resistance, and over 40 percent of individuals over the age of 50 are at risk for developing insulin resistance. If you fall into these categories, what are your symptoms? What is causing your insulin resistance? And most importantly – what can you do to treat your insulin resistance? Let’s take a closer look at insulin resistance. Our bodies produce our own insulin. The pancreas is the organ that is responsible for insulin production; the beta-cells are the actual cell inside the pancreas that makes insulin. Basically what this definition is telling us is that eventually, these cells are unable to keep up with our bodies needs. In a perfect world, the beta-cells would be able to make the exact amount of insulin needed to bring down our glucose levels. However, there may come a time when the beta-cells are unable to keep up, thus causing prediabetes, and eventually type 2 diabetes. Insulin resistance is actually linked to several other medical conditions as well; being obese increases the risk of developing insulin resistance, even in the pediatric population. 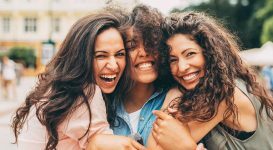 Insulin resistance is also linked to polycystic ovarian syndrome (PCOS) – studies estimate that 50-70 percent of women with PCOS have insulin resistance. The pathogenesis of insulin resistance also seems to be linked to hyperlipidemia, cardiovascular disease, and hypertension. The cause of insulin resistance is not fully understood. However, there are several risk factors that seem to contribute to its development. You live a sedentary lifestyle. You are on high doses of steroids for a long duration of time. Consume a high-calorie, high-carbohydrate diet. 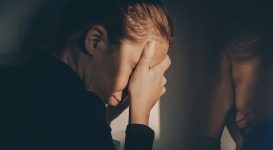 Have chronic stress and do not manage it effectively. Suffer from Cushing’s disease or PCOS. Have a family history of type 2 diabetes. Are from certain ethnicities (African American, Hispanic, Asian). Are on certain medications (steroids, as discussed, or cyclosporine, thiazide diuretics, niacin and protease inhibitors, and nucleoside analogues). Have a waist circumference that is greater than 35 inches in women or greater than 40 inches in men. Have high levels of insulin and inflammation (both of which can be measured with a blood test). Have excess fat stored in pancreas and liver. 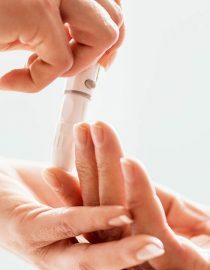 Insulin resistance is typically “silent,” meaning that it often has no symptoms whatsoever. Because of this, people with insulin resistance often do not know they are insulin resistance for some time – even years! One symptom that is common, however, is acanthosis nigricans. Acanthosis nigricans is the presence of dark patches of skin. These dark patches of skin present themselves are rings around the neck or may appear on the elbows, armpits, knuckles, and knees. When acanthosis nigricans occurs, it is most likely to occur in Hispanics and African Americans than in Caucasians. A1C test. A level of 5.7 to 6.4 percent is the diagnostic criteria for prediabetes, and above 6.4 percent indicates diabetes. Fasting plasma glucose (FPG) test. This test is performed on someone who has not taken in caloric intake for eight hours. A fasting blood glucose level of 100 to 125 mg/dL indicates prediabetes, and above 125 mg/dL indicates diabetes. Oral glucose tolerance test (OGTT). Again, this test is performed on someone who has not taken in caloric intake for eight hours. The person then gets a blood draw and ingests a sugar-sweetened beverage. The blood is drawn two hours later. A blood glucose level of 140 to 199 mg/dL indicates prediabetes, and above 200 mg/dL indicates diabetes. To date, the Food and Drug Association has not approved any diabetes medication specifically for the treatment of insulin resistance. That being said, we know enough about diabetes medications that we know which medications may work best for the treatment of insulin resistance. It is kind of a “super drug” in the diabetes world – so much so that it is typically the first drug prescribed when you’re diagnosed with type 2 diabetes. 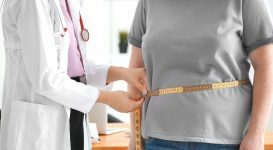 Other medications can cause weight gain, as well as hypoglycemia (low blood glucose levels) – and metformin does not cause these side effects, which makes it advantageous. It is also FDA-approved to be used with other diabetes medications, such as insulin, glitazones, sulfonylureas, DPP-4 inhibitors, and GLP-1 analogues – so if metformin alone is not decreasing blood glucose numbers, adding another medication is safe with this medication. 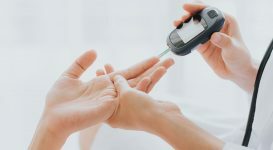 Although Metformin is not FDA-approved to treat insulin resistance, it is recommended by the American Diabetes Association (ADA) for the prevention of type 2 diabetes. This means that it can be used to treat prediabetes – which is often when insulin resistance rears its ugly head. What does this mean? Metformin is the front-line medication for treating insulin resistance. That being said, there are a slew of medications that can be prescribed should blood glucose levels rise when Metformin cannot control blood sugar levels adequately. 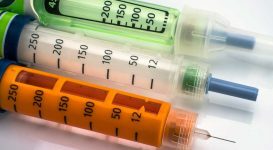 What is insulin and is it a complex or intimidating treatment? Find out what insulin is and more information on using insulin to treat diabetes here.